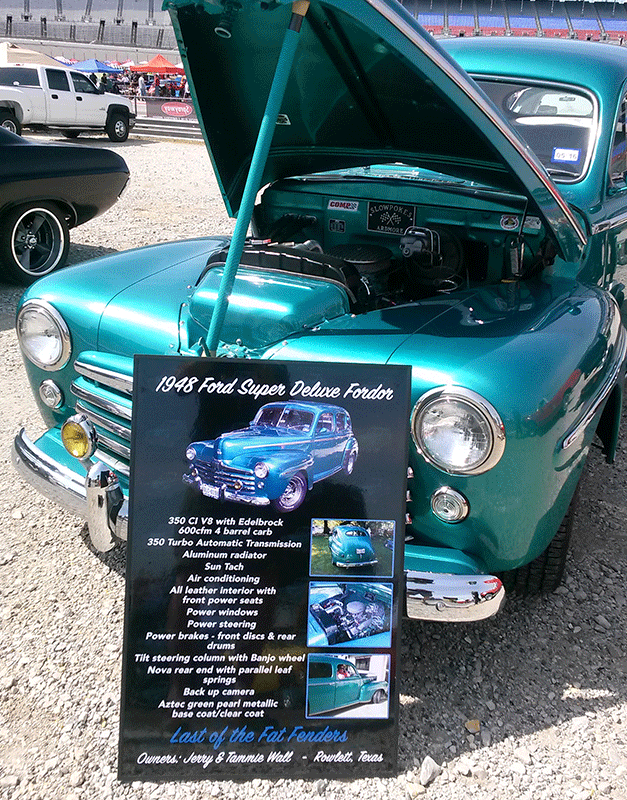 Creating the best car show sign is not an easy, or inexpensive. It takes a lot of time and money to create a great sign, because our customers deserve the best car show sign available! We realized long ago that it starts with quality control! We print our own, we laminate our own, and we assemble our own, we do everything so that we can control every aspect of the sign. That’s where the difference really lies! Most of our competitors that make car show signs and car show boards just design your sign and then send it off to a copy and print shop. So there is no real consistency, they are at the mercy of whoever is behind the desk, with whatever experience they have. We, on the other hand, have over 10 years experience solely making great car show signs! Quality control also entails making sure we only get the best supplies possible for our car show signs. We meet with our suppliers regularly to insure they are providing the best supplies for your car show sign. We buy in bulk to minimize the chances differences between manufacturing runs would affect our production. We profile every roll of media to make sure print quality is not affected. We want to deliver the highest quality car show sign… because you deserve it! The area of our production of car show signs that far exceeds anyone else making car show signs or car show boards is the technology we use to produce our signs. We’ve invested in a color management system to insure the colors we put into our design is what will appear on your car show sign. We profile our computer monitors, our printers, and our media constantly to make sure they are producing the highest quality print for your car show sign. And our printer is really the key to making a great car show sign. We use a 12-Color Canon photo printer to produce the best car show sign. Your average printer only uses 4 colors; ours uses 12 to create a photo quality print that has awesome color quality! But Probably the most critical aspect of a car show sign or car show board is the design, and that is where we are the best! We have over 10 years creating the best car show signs, and we do what others wont… like cropping out backgrounds. Yes, it is VERY time consuming, but it is worth it! Like most things in life, the more time you put into it the better it will be. So after we design your car show sign, we print it on our Canon imagePROGRAF printer on a weather resistant media with a permanent adhesive backing. We chose this media after months of testing to make sure it would provide for a great base to create a car show sign. We refer to this as the base because image is everything, and we want your car sign to look good for a long, long time! Then, after we print the sign we laminate it to make it the most durable sign. We want your car show sign not to fade over time, or have the ink run if your sign gets wet. We go the extra mile, even when our media manufacturer says it’s “overkill”, to make sure your sign lasts for the long haul! The rest of our car show sign is really where the rubber meets the road. Most makers of car show boards use foam board to mount their signs on. This is an absolute joke in our view! Foam board is flimsy, dents easily, the corners can bend without really trying, and doesn’t last long. You would think if you are paying that kind of money for a car show board, they would at least mount it on something durable! That’s why we use a PVC signboard to mount the print! It’s been used by sign makers for years to make durable, but lightweight signs. It makes for the perfect car show board because it is lightweight enough to make it easy to transport, and durable so that your car show sign lasts for a long time. We then protect the edges of the sign with a plastic edge cap on all 4 sides… which nobody else making car show boards does! This prevents corners from breaking, edges from peeling, and gives the car show sign a nice, finished look! The beauty of our car show signs is they can be used in several ways. You can use your car show sign with the included aluminum leg to stand the sign at car level, you can use an easel to display it at eye level, or you can purchase our stainless steel display stands (coming soon) to create a very unique car show display! No matter how you display your car show sign, you can take pride in knowing you have the best car show sign available… made by people who are proud to stand behind their work!